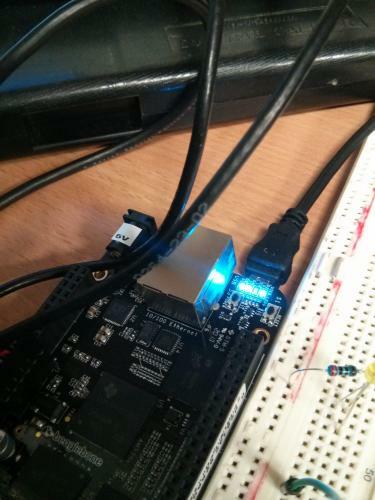 The BeagleBone black, using its AM335X CPU, provides a number of GPIOs. Let's try to make them work. dmesg indicates that the kernel found a GPIO device. devinfo and ofwdump confirm that the corresponding nodes exist. Reading the kernel source code indicates that the GPIOs are used with a tool called gpioctl. Listing the available IOs shows that some of them are already configured. Let's try to play with the board's 4 builtin LEDs. Let's try configure another random IO. GPIO1_17 (P9.23) should be configured as an open-drain output pin. Let's try to change its value. We created a very slow bit-banged PWM.